Colombia’s Carlos Ramírez has had an amazing year, from a Papendal podium early in the summer, a world number 8 plate in his home town of Medellín to an amazing Olympic bronze medal in Rio … from 8th to 3rd in the final, study the video’s … the art of BMX racing in a nutshell! The ‘Little Magician’ has made the skill of seeing gaps and exploiting them second nature. We suspect if your asked his fellow Elite riders who they would least like behind them in an important race, Carlos Ramírez’s name would be at the top of the list. 15: First off, congratulations on the medal, amazing … but before we get to that … what was your build up to Rio like? Carlos: Thank you, it was amazing for sure and the build up towards Rio was an amazing journey with ups and downs but in the end it paid off, it was really hard training and racing but at the end everything came together. 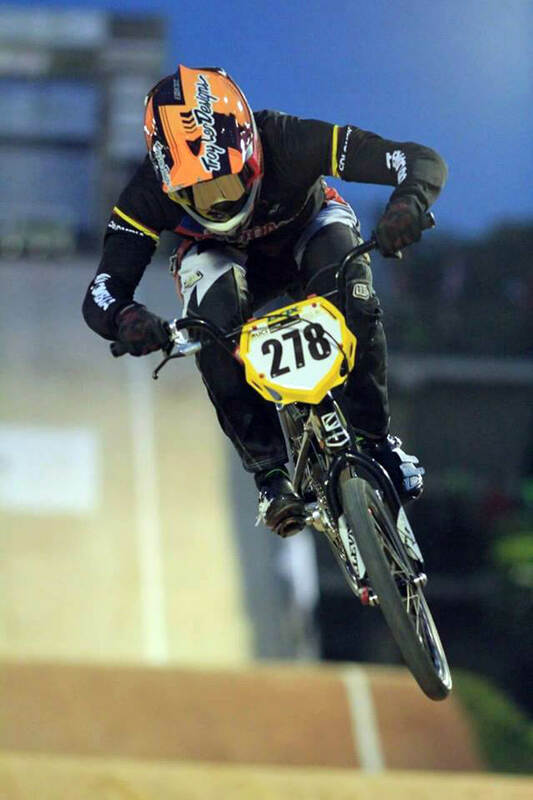 15: In BMX terms, Colombia has a massive amount of experience at the Olympics with 2 medals from London. Did you get any advice from Mariana or Oquendo on what to expect … did it come close to preparing you for the enormity of the event? Carlos: I did talk to them about it, we talked about what it was like, what to expect and how to actually feel but I used to talk about it even more with Jimenez, he has 2 Olympic diplomas so he talked me through a lot of his experience and it really helped out … he was a big help in the process. 15: The Rio track saw some major changes after the test event, what was the track like to ride by the time the games rolled around? Carlos: I liked the track from the beginning, I like big and challenging tracks and Tom (Ritz) always makes them like that but after the changes it was really good, fast and fun. Once I got on it I had a great time and enjoyed it. 15: Did the green berms and jump lips cause you any issues? Carlos: It was a bit weird at the beginning ’cause we are not used to colors in the track I guess haha. After a while it was nice and it looked really nice for the public so it was cool to have something different for a change. 15: How did you feel during the qualifiers and going into the final? The stands looked like a sea of Colombian flags … that alone must have made a difference? Carlos: It honestly felt like racing at home, we had so many Colombians in the stands that it was crazy. I think I was feeling my best through quarters qualification but it was awesome to have so much support to push me and give me that extra energy. 15: So, the final! From gate 7 and 8th position down the first straight to 3rd at the line after two amazing berms (1 & 3) … what were you thinking on the gate? Talk us through your thought process as you worked your way through the pack. Carlos: Every time I get on the gate I think I can do it … I can be on that podium. When I got up there I said ‘well here we are I’ve worked so hard for this, to be here at this moment’, so I wanted to enjoy it. I didn’t get out good, I wasn’t feeling good out of the gate in Rio so I knew I had to have a good first turn and good track speed. When I got to the last turn I just said ‘it’s all or nothing’ and just went for it and it worked out pretty good. 15: Did you think you had the medal when you crossed the line? The timing system gave you and Nic the exact same time … how did you find out for sure it was yours? Carlos: I did feel I could have gotten it but when I saw the board and saw Nic in 3rd, I said ‘it looks like is not mine this time’. Then I found out thanks to a volunteer that came up to me and told me is yours but wait until we announce it. It was the best feeling I’ve ever had! Carlos: I think I’m pretty good at making last minute decisions and finding holes anywhere on the track. No, I always give my best from the gate, I try to go out in front but if it doesn’t work out I just give it my all ’till the finish line and do everything I can to get the in front. I guess I’m pretty good at taking turns so that helps me out a lot. 15: Where is your Olympic bike now? Are you still riding it or is it hanging on a wall somewhere? Carlos: It’s still in my bag after the world cup in Sarasota, I will probably hang it somewhere. 15: We love the understated Colombian graphics on the frame, did you have much input into how the bike was going to look or was it a surprise when it arrived from Chase? Carlos: Most of the input came from my Mom, Dad and Cousin who got all the graphics done and got the stickers sent to me in Rio. German and Carlos, our mechanics, got them on the bike before training. It was a big surprise for sure, my bike was a normal chase but we customized it before the Olympics. 15: Reflecting back on the whole ‘Rio experience’, what was the stand out moment for you, obviously there’s the medal but was there a point where you just thought ‘wow’? Carlos: When I got to the village I said ‘wow, I am really here my dreams are coming true’, that was my first wow, then the medal came and the dream was coming true all the way. Carlos: It was great I could feel the people and all Colombians support … so it was great. 15: Colombia is one of most successful BMX Nations at the Olympics with 4 medals … has it made the sport much more popular at home? Carlos: Yeah, the sport here in Colombia is really popular now , everyone knows what BMX is and who we are. 15: Where do you keep your medal? Carlos: My medal is in my room right next to me, so I can see her every day. 15: Are the 2020 Tokyo Games something your thinking about yet or are you just going to enjoy BMX for a couple of years first? Carlos: It’s something I’ve been thinking about since I crossed the finish line in Rio but I think I wanna keep enjoying my sport like I’ve always done. 15: We can’t leave you without asking about the Worlds in your home town. Another amazing experience? Carlos: For sure, it was crazy racing in my home town and hearing the crowd go crazy. I can just say it was for sure a great experience I wanna have sometime again … would be great to have a big event home again. Carlos: I’m still working on the plans and getting the calendar ready, for now I would say the worlds but maybe things change, let’s see what happens. I’m also planning on getting my studies at college so let’s just see how 2017 unfolds.